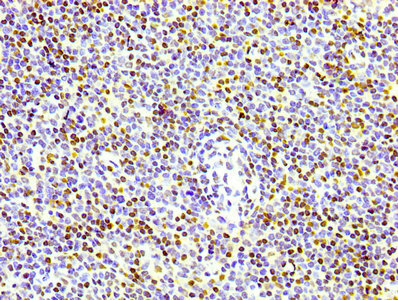 IHC image of Histone H3.3 Monoclonal Antibody [RMC109B] diluted at 1:100 and staining in paraffin-embedded human pancreatic tissue performed on a Leica BondTM system. After dewaxing and hydration, antigen retrieval was mediated by high pressure in a citrate buffer (pH 6.0). Section was blocked with 10% normal goat serum 30min at RT. Then primary antibody (1% BSA) was incubated at 4°C overnight. The primary is detected by a biotinylated secondary antibody and visualized using an HRP conjugated SP system. 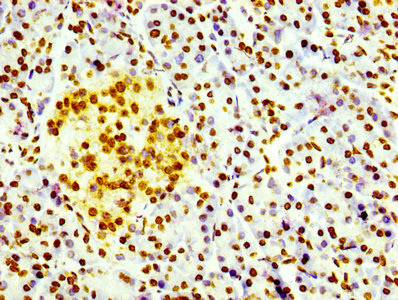 IHC image of Histone H3.3 Monoclonal Antibody [RMC109B] diluted at 1:100 and staining in paraffin-embedded human lymph node tissue performed on a Leica BondTM system. After dewaxing and hydration, antigen retrieval was mediated by high pressure in a citrate buffer (pH 6.0). Section was blocked with 10% normal goat serum 30min at RT. Then primary antibody (1% BSA) was incubated at 4°C overnight. The primary is detected by a biotinylated secondary antibody and visualized using an HRP conjugated SP system. 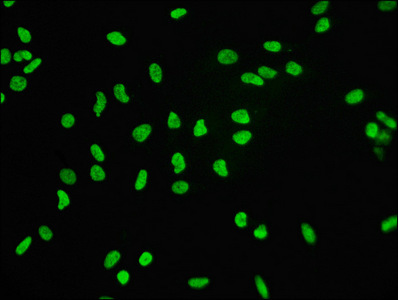 Immunofluorescence staining of Hela cells with Histone H3.3 Monoclonal Antibody [RMC109B] at 1:60, counter-stained with DAPI. The cells were fixed in 4% formaldehyde, permeabilized using 0.2% Triton X-100 and blocked in 10% normal Goat Serum. The cells were then incubated with the antibody overnight at 4°C. The secondary antibody was Alexa Fluor 488-congugated AffiniPure Goat Anti-Rabbit IgG (H+L). Variant histone H3 which replaces conventional H3 in a wide range of nucleosomes in active genes. Constitutes the predominant form of histone H3 in non-dividing cells and is incorporated into chromatin independently of DNA synthesis. Deposited at sites of nucleosomal displacement throughout transcribed genes, suggesting that it represents an epigenetic imprint of transcriptionally active chromatin. Nucleosomes wrap and compact DNA into chromatin, limiting DNA accessibility to the cellular machineries which require DNA as a template. Histones thereby play a central role in transcription regulation, DNA repair, DNA replication and chromosomal stability. DNA accessibility is regulated via a complex set of post-translational modifications of histones, also called histone code, and nucleosome remodeling. Histone H3.3 Monoclonal Antibody , clone RMC109B. Unconjugated. Raised in: Rabbit.